Weaver ants or green ants (genus Oecophylla) are eusocial insects of the family Formicidae (order Hymenoptera). Weaver ants are obligately arboreal and are known for their unique nest building behaviour where workers construct nests by weaving together leaves using larval silk. Colonies can be extremely large consisting of more than a hundred nests spanning numerous trees and contain more than half a million workers. Like many other ant species, weaver ants prey on small insects and supplement their diet with carbohydrate-rich honeydew excreted by small insects (Hemiptera). Oecophylla workers exhibit a clear bimodal size distribution, with almost no overlap between the size of the minor and major workers. The major workers are approximately 8–10 mm (0.31–0.39 in) in length and the minors approximately half the length of the majors. There is a division of labour associated with the size difference between workers. Major workers forage, defend, maintain, and expand the colony whereas minor workers tend to stay within the nests where they care for the brood and ‘milk’ scale insects in or close to the nests. Oecophylla weaver ants vary in color from reddish to yellowish brown dependent on the species. Oecophylla smaragdina found in Australia often have bright green gasters. These ants are highly territorial and workers aggressively defend their territories against intruders. 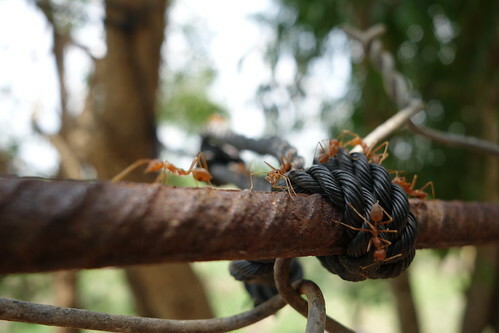 Because of their aggressive behaviour, weaver ants are sometime used by indigenous farmers, particularly in southeast Asia, as natural biocontrol agents against agricultural pests. Although Oecophylla weaver ants lack a functional sting they can inflict painful bites and often spray formic acid directly at the bite wound resulting in intense discomfort. 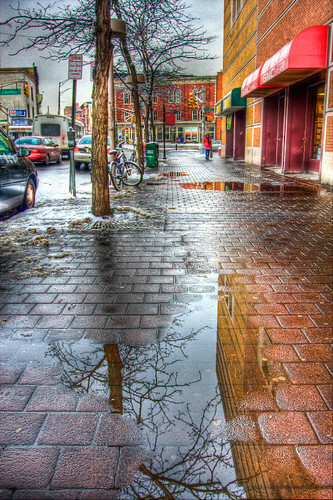 Wet dirty sidewalk after the snow melts. Must be global warming (sarcasm). Standard 3 exposure (+2..0..-2 EV) taken handheld using Canon 17-40mm lens.